We offer a range of Vane Axial Cooling Fans that are used for air conditioning, industrial ventilation and fumes. These are fabricated from mild steel plates and have been provided with foot mounting arrangements and flange on both ends that facilities installation of the fan. 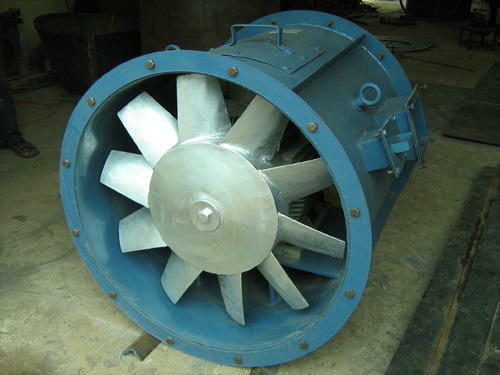 The dynamically balanced impeller of axial flow fan is manufactured using mild steel and aluminum alloy.. The induction type standard A.C. motors are provided with squirrel cage appropriate for temperature up to 40úc. also, motors and flame proofs vapors tight can be supplied on if required by the client. Ball or ball roller bearing has been used. We have supplied two types of arrangement that is direct drive arrangement or v -belt drive arrangement. Fan is suitable for air, up to temperature of 70 C.
V - Belt drive arrangement for the temperature between 70 and 160 and are equipped with special high temperature lubricated ball bearings.